I usually don't love religious based movies because they seem to stereotype once in awhile but this one seemed to have a positive edge to it and the acting wasnt half bad either. I actually really enjoyed it. Wow... is this movie bad... someone must be paying ppl to write these remarks or there are some pretty devoted Christians statved for entertainment. The IMDB critics even bashed this movie and they love everything. My friend, whose birthday present was dinner and this movie, said, "Thank God we can still go to to a cinema and see this kind of movie in Canada." As for me, this movie reminded me to stay focused on staying true to our Lord no matter what! That's what really matters in life after all, Jesus is The Way, The Truth and The Life FOREVER!!! Thank you for producing this movie. I pray there are more movies like this coming. God Bless you BIG TIME! For those who have a heart, a must see movie. 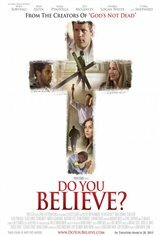 This movie begs the question of all those who profess to be followers ofChrist: "is there enough evidence of faith to convict me?" Or, does what I say I believe convert into the way I live? I literally left the theatre in tears. I was so moved and touched by this movie. It covered so many areas in life that pertain to me personally. I left wondering what more I could do for Christ. How can I impact the world and reach out to non-believers? There are so many lost souls who need the power of the cross in their lives. A "must see" film. Invite your family and friends. This movie will win souls for the kingdom. Only the things we do for Christ will last. God is using powerful platforms to reach any and everyone. It is the will of God that no man should perish. Do you believe? Started to believe, but, I didn't understand why Odin would allow Loki to wreak havoc on the earth. Then I remembered it's all fairy tales, like the Hobbit and Scientology. Ending was overdone (too much drama) though I liked the fact that when I flunked once God creates a way out to believe in myself, again (the soldier). But reading the reviews (especially the negative ones) is terrific to see people struggle. Very realistic and well done. Good to see Lee Majors and Sybil Shepherd and Sean Astin. Kept thinking of the hobbit in Sean's scenes. The different stories were interwoven very well. Both my husband and I had tears in our eyes during many scenes. It was such a good mixture of different personalities learning to forgive, break from the past, having courage and faith. The car crash scene was exciting. There were so many things to keep track of, I need to see it again. Too bad for the person who walked out near the beginning after the pastor's wife brought the girl home after having refused to do it at first. You find out she can't have kids so she thought she couldn't do it. No one should write a review on a movie they watched for 15 minutes.